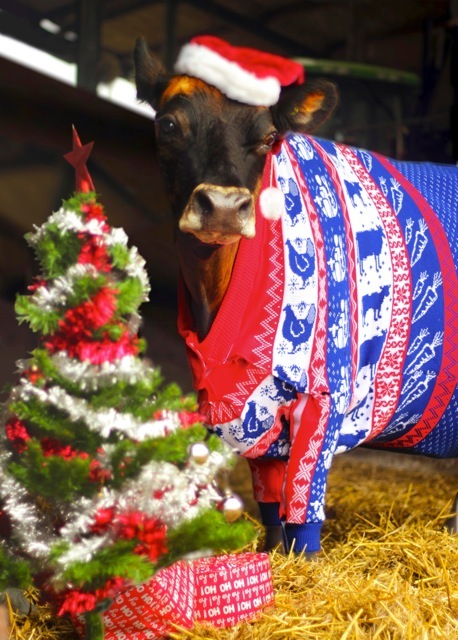 Send a Cow this Christmas – No, Really! - Reclusive Fox ""
Send a Cow this Christmas – No, Really! Christmas jumpers and the festive period go hand in hand. They’re seen everywhere, even on cows…Well, one very special cow in particular. 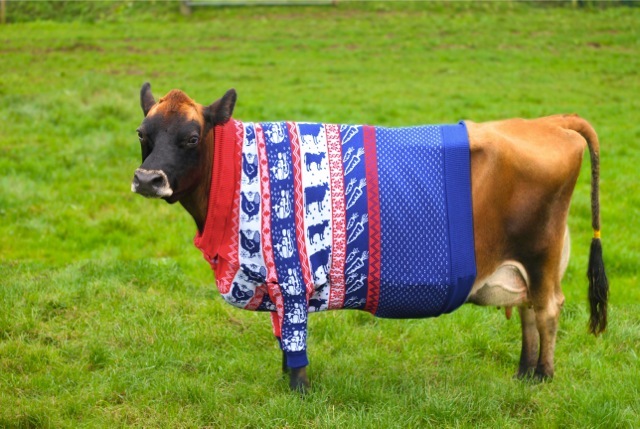 Meet Gloria, she’s wearing a very fashionable Christmas jumper that has been custom-made just for her. But she’s not just jumping on the fashion bandwagon, Gloria is wearing her jumper to help raise awareness of a fantastic campaign that needs your help. The Send a Cow campaign is working hard to help raise awareness and make a difference to African families that are living in poverty. The goal is to raise funds by selling 20,000 festive gifts available from www.sendacowgifts.org and the money raised will help families help themselves out of poverty. The gifts on offer are varied but all are worthwhile, starting from as little as £5. You could decide to skip buying Christmas cards this year or make do with the decorations you already have and send a that will make a difference. Or perhaps you’d like to send a more substantial gift, like a cow! For seven pounds a family in Ethiopia, Lesotho, Uganda or Kenya will be sent a chicken. The family can learn how to make the chicken a suitable house so the chicken enjoys a happy life, laying eggs for the family and providing them with a supply of manure to make decent compost for crops. Chickens are often given to orphans because they are easy to look after and manage and they don’t need a lot of space. Just £30 is enough to support the training programmes schools, teaching children about health and nutrition in Ethiopia and Uganda. They learn about how to grow vegetables and fruit on the school plot as well as working together as a team. Your £20 will give a family a toilet, something we are all guilty of taking for granted. Send a Cow work with the family, giving them the skills and knowledge to help them build a toilet with local materials. This is a gift that is sent to families living in Lesotho, Rwanda, Uganda, Kenya, Burundi and Ethiopia. Send a Cow was set up by West Country Farmers 25 years ago and have helped 1 million people over the years. Why not pay their website a visit and see if there’s something you’d like to send this year. This is an absolutely brilliant idea and I had no idea you could do something like this! Looking into it now! I feel sorry for the cow but I love the idea of this campaign! Shall we follow each other on Bloglovin as well? I would love to.